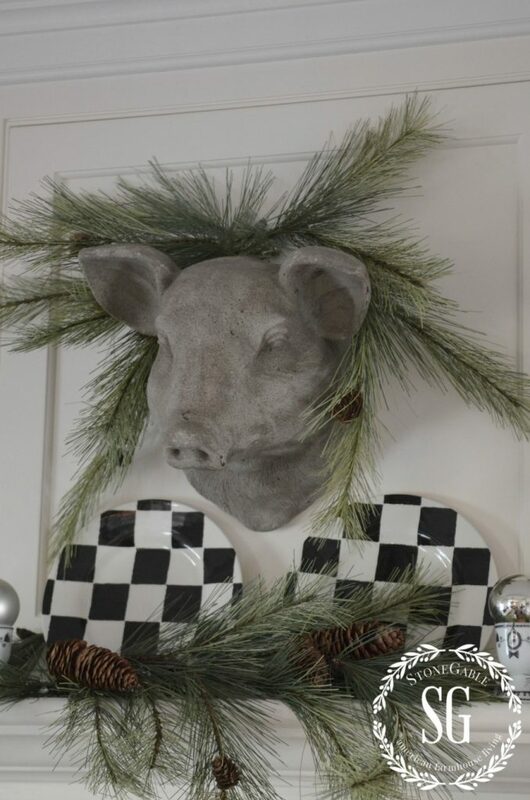 I’m decking the halls and kitchen… farmhouse style this Christmas. 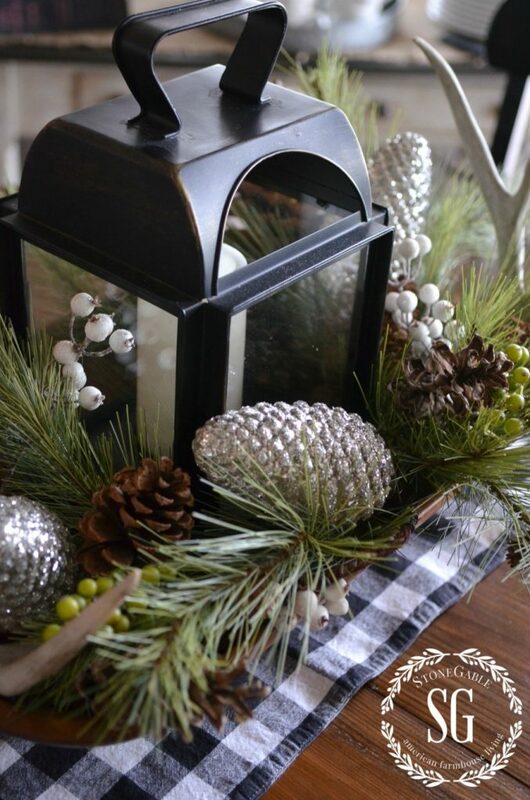 I love love love the beauty of fresh greens and pinecones and berries with a little bling! This year I am embracing citrus hues of greens. And like last year, I’m still enthralled with black and white… especially check! Maybe the colors are not quite traditional, but the pine boughs are! Because I have a busy, working farmhouse kitchen I go easy on Christmas decor. A touch here and some greens there! I like easing Christmas into my existing decor! 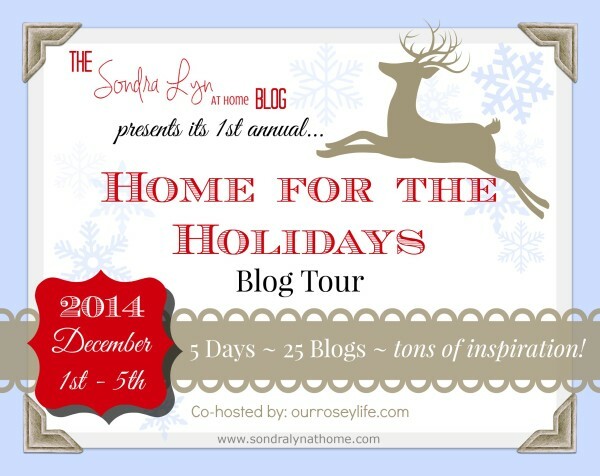 I am thrilled to be a part of HOME FOR THE HOLIDAYS BLOG TOUR. 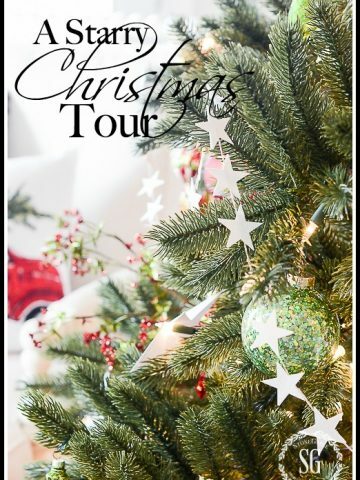 A big thank you to Sondra Lyn from SONDRA LYN AT HOME for putting this Christmas tour together! Make sure you see the line up at the end of this post! This year I love love love white pine. Its long needles are casual and have hints of beautiful citron hues. 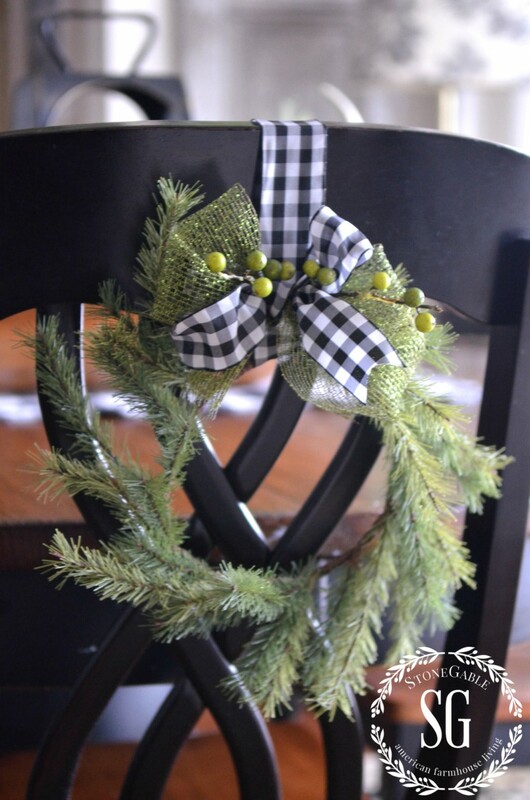 And the color looks rich with black and white check… like the bows in the pine wreaths that hang on the back of our kitchen chairs! 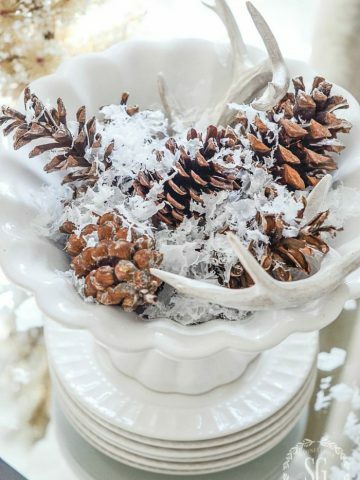 A hand carved dough bowl is filled with white pine, pinecones, deer sheds and berries and sits on my kitchen table. A rustic lantern rests in the middle of the arrangement. I’m using a battery operated candle on a timer so my candle glows all evening! This is such an easy arrangement to put together! 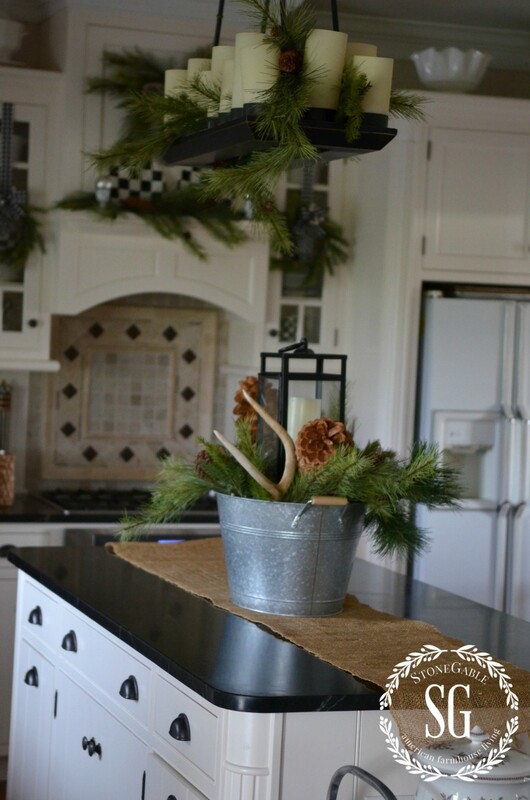 I was inspired to use a galvanized bucket filled with pines and pinecones on the kitchen island. Just like the dough bowl on the kitchen table, I put a lantern in the center of this arrangement too! My soapstone island is my primary workspace. So keeping decor to a minimum is crucial. I can throw back the burlap runner and have a great work surface without moving decor! 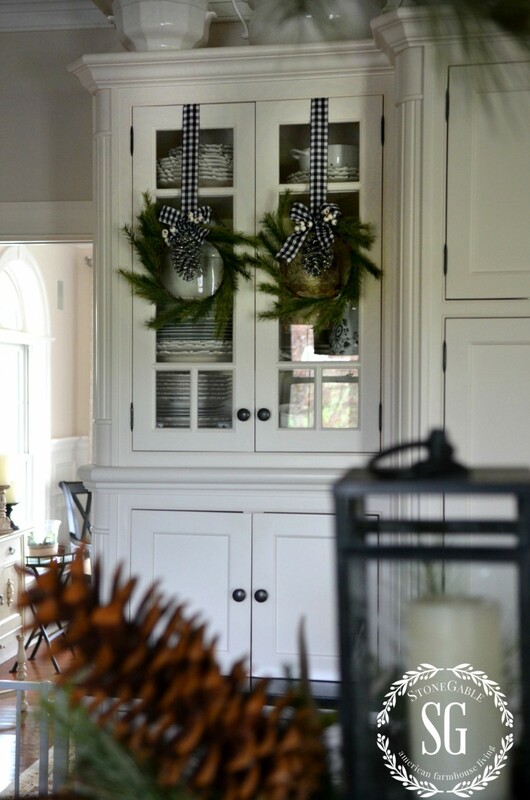 Pine wreaths on black and white checked ribbons are also hung on some of my glass front cabinets. Simple and oh, so farmhouse! The stovetop hood is decorated too. Earl, the pig, never looked so handsome! And every kitchen needs a little sparkle! I’ll be sharing more in my kitchen next week! 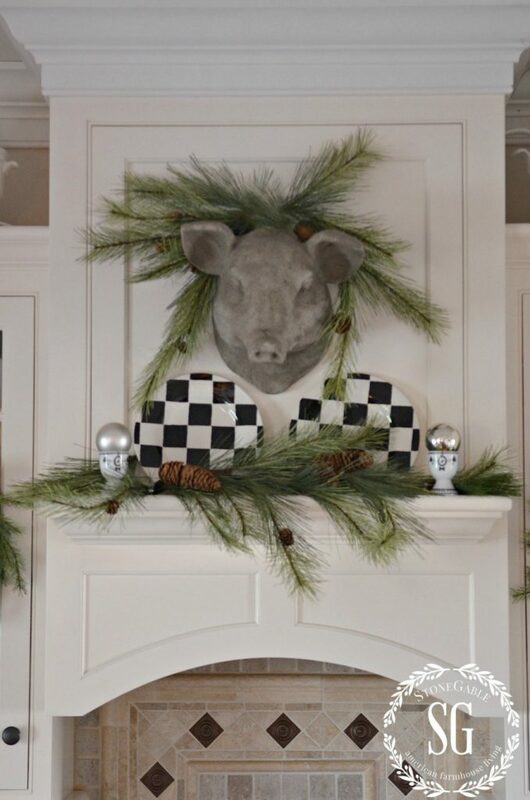 Make sure you check out all the HOME FOR THE HOLIDAYS posts this week! Remember to pin this to your Pinterest CHRISTMAS board. 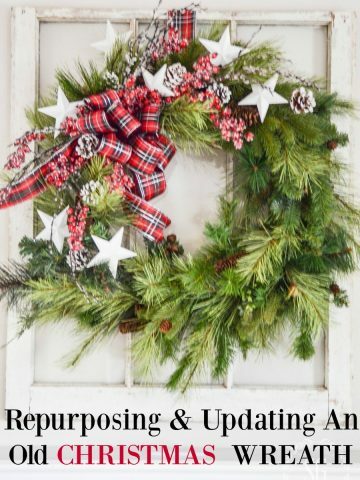 You will have a great resource for all things Christmas! You can follow me on Pinterest HERE and see what I’m pinning! Love your black and white theme for the holidays. I was wondering where you purchased the lantern in the kitchen table display. Love it all! Thank you for sharing! Hi Bonnie, I got this lantern years ago at THE POTTERY BARN. Good Morning! A friend just sent me your post as she knows I’m trying to build an island for my kitchen. The soapstone one pictured in your blog is exactly what I’ve been trying to put together. Would you mind sharing any details on it that you may have? I would appreciate it so much! I have wanted an island in my kitchen for years and don’t want to settle for one that will do. The one in your picture is perfect! I love love love my soapstone countertops. They are inert which means they do not react to hot or cold and do not stain. To get that shiny rich look I rub my soapstone down with mineral oil about once a month. Soapstone is a very hard stone, but like all stone, they can dink. I have a couple tiny spots on my counter that have the smallest chip in them. But they are not noticeable. Soapstone is beautiful and durable and a joy to have in my kitchen. I hope this helps you Cathie. I do love your kitchen!!! Yes, we have to use artificial greenery outside and in, too hot outside( I live in Coastal Carolina) and if it is cold outside, we have the gas fireplace and greenery doesn’t survive very well…Esty had good ribbin, moire, my personal favorite!!!! Looks just Fabulous !! Makes me itchy to decorate ! But alas house is on the market and hoping it sells very soon cause all my decor is packed !!! 🙁 I might have to live it thru bloggers ! Carry on !!!!!! I love your blog! I love how you used so much greenery in your decorating. I am trying to simplify my holiday decorating. I do not put a lot in my kitchen, but you gave me some great ideas. Where do you get your white pine? I have a white pine in my yard, but just wondering if you buy yours from a greenhouse or nursery. Also, do you have a problem with the needles falling off? I like to start decorating the weekend before Thanksgiving. Thanks! I am loving your decor and home, thanks for sharing! Currently I have all white walls. Can I ask the color of your walls in the kitchen? I love it! Thanks a bunch! That is an older wall color. It was from Benjamin Moore and it is “Hush”. The color in my kitchen now is Sonnet and I love it. Hope this helps. I just discovered your blog. Your beautiful kitchen and impeccable taste have inspired the redo of my 70’s kitchen. Can you let me know where you found the pendant light above your sink (with b & w shade) as well as your chandelier with the wicker shades? Both are just perfect in your farmhouse kitchen! Welcome to the StoneGable family, Karen! The pendant light above my sink came from Ballard as did the chandy! Hi there, I have recently found your gorgeous website! Such inspiration here. I am wondering if you have a special place to buy your ribbon, I would love any information you can share. Thank you for putting your beautiful home and decorating style here for everyone to enjoy! HI HEIDI, Welcome to the StoneGable family! I usually buy ribbon wherever I can find it. Nowhere special. Try online too! Your kitchen is absolutely beautiful. Tastefully decorated – very warm and inviting. Will you share the paint color of your cabinets? Also, are your hinges black or oil-rubbed bronze? I have a kitchen remodel planned soon. Thanks for your nice comments. The color of our cabinets are Benjamin Moore Atrium White. It is a soft and warm white. The hinges are oil rubbed bronze. Your lime green/black-white theme inspired me this year. I decorated the tree here in the office in green/black-white bows with silver accents. It is SOOOOO cute! I am so excited to come in and open your post each morning! Thanks, Michelle! I’m so glad you found me too! You are so sweet to let me know! I love the natural simplicity of your Christmas kitchen! The greenery paired with the black and white is so lovely! So beautiful Yvonne! 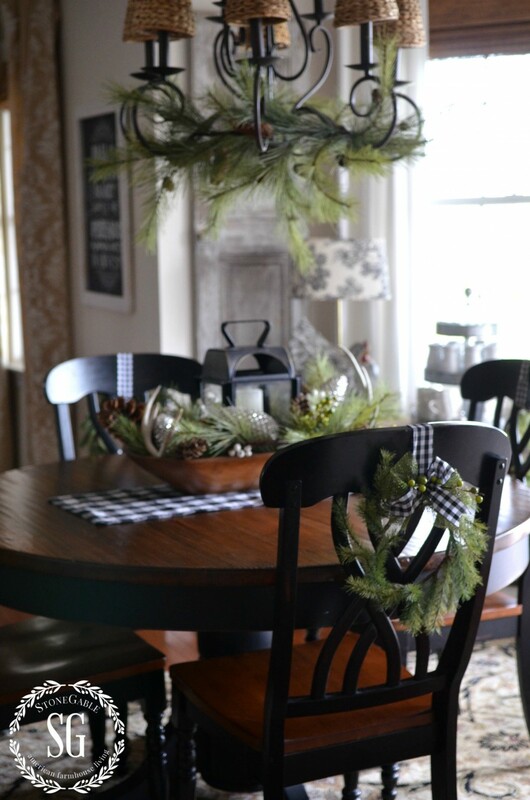 Love the wreaths on your chairs and the black and white gingham. Fun being on this tour with you! Gorgeous, Yvonne! I love it that even Mr. Pig got a little something-something for the Christmas season! He looks fabulous! 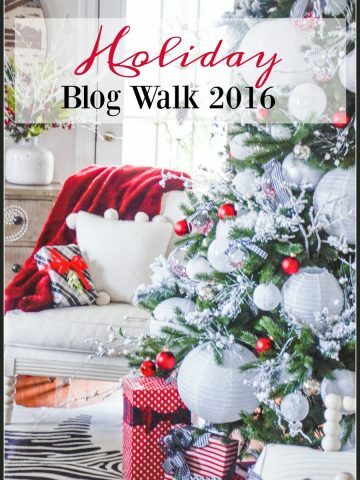 Yvonne it’s always a treat to visit your beautiful blog especially when I get a little tour.Your kitchen is gorgeous,I love all of the special touches and details in your beautiful Christmas home! 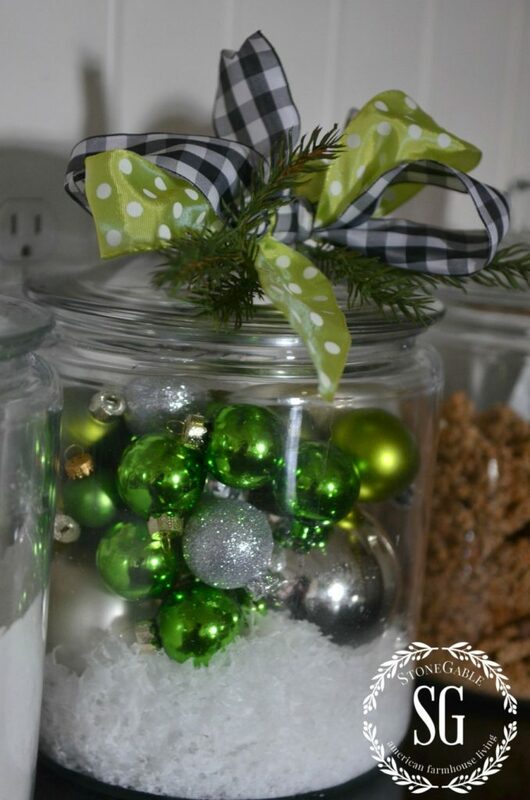 Amazing, such beautiful Christmas decor in your farmhouse kitchen! So excited to be on this tour with you! Happy Holidays! 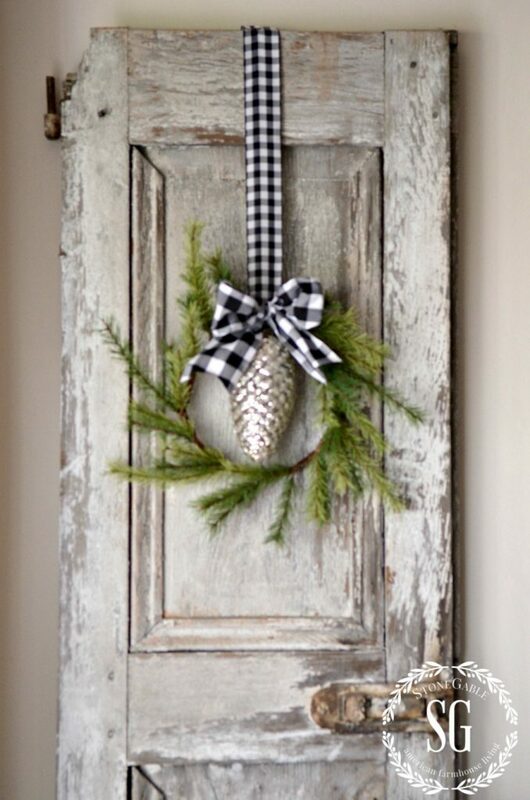 Hi, love the greenery and pinecones, didn’t see in your replys, where did you get the shimmering pinecones? The softness of the green is sublime with the dramatic black and white! Gorge! This kitchen is gorgeous! 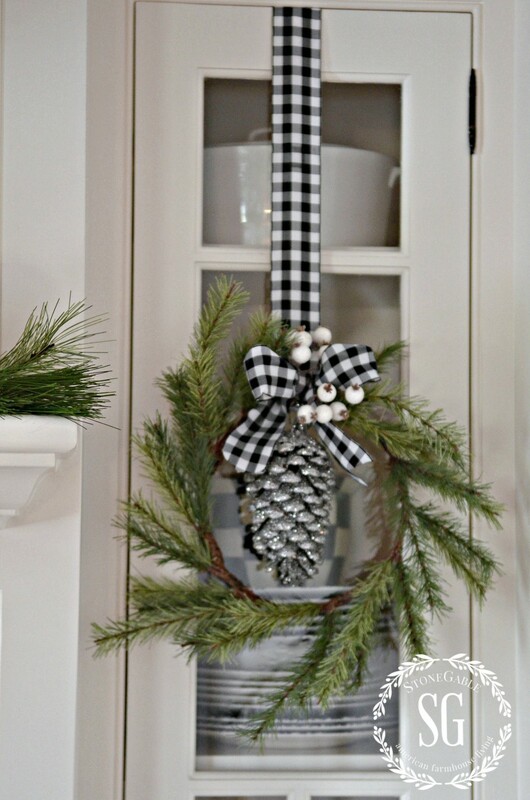 Black and White is my fave combo and you nailed it with this Christmas decor! Yvonne, your kitchen is always so warm and welcoming no matter the season, but your Christmas decor is just so, so fabulous! LOVE it!!! .. you are amazing and I am so excited to decorate now!!! Lots of wonderful inspiration! I’m a big fan of black, white and green. It looks so fresh and lovely. Beautiful job, Yvonne! Lovely kitchen & beautiful decor! I know I can probably get the ribbon anywhere – but of course I’m just curious where you purchased yours?? Some ribbon came from my local AC Moore and some I got from Amazon. Hope this helps. Beautiful! I love your decorating style! Everything is so classy and clean looking. You can come to my house anytime and decorate! I absolutely love all of your decor it is always so beautiful. The kitchen is just perfect! Where do you get your greenery from. That is so gorgeous. I love your style. I love to decorate with the black and green also. I throw in a wee bit of red at times too. You have given me a few more ideas I would like to try. Thank you so much ! Yvonne, you know you’re going to have to answer all our questions about where you got this or that even tho we may not live in your part of the country (or especially if we do!). So, I’ll add mine to the list: where did you get those gorgeous shutters? I’ve been to Lancaster many times and keep stopping at all the antique places I can find, but never find any that are quite as chippy and beautiful. Give me a hint and make my holiday shopping complete! P.S. my husband’s family used to live in New Holland, so I feel like home when I’m there. Hi June, I love New Holland!!! Go there often. I got the shutters from The Antique Village on 896 in Ronks (so close to Strasburg). Hope this helps!! Many thanks. I have been there several times and saw a pair recently in green, but I’ve got my heart set on white. Guess I’ll have to keep checking when I’m in the area. Just had lunch at Sugarplums and Tea…delicious! 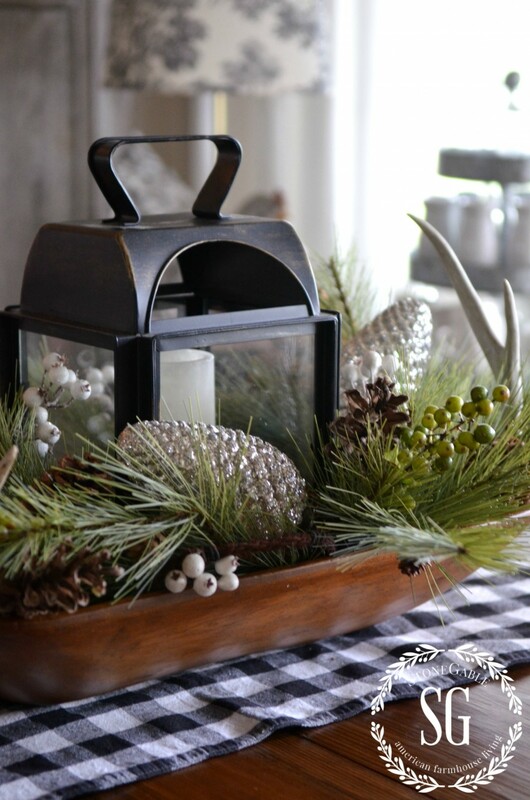 Greenery combined with pine cones and black and white makes a beautiful color pallet for Christmas decorating. I love your kitchen design and how you you decorate it for the season. Everything looks fabulous, as usual! You know I’m a big fan of black and white and may make some of those wreaths next year! Earl is going to get the big head with all the compliments he’s going to receive! Happy to be on tour with you! Pinning and sharing! Your greenery with black looks gorgeous!! Love that combination…very farmhousey! Everything is immaculate as always Yvonne, so happy to be on the tour along with you and your beautiful home! I love your kitchen and your decorating style. You have given me such inspiration. I too have the same question as many about your garland – is it real or fake because it certainly looks real. I always look forward to your postings. Gorgeous home. The pine boughs are all fake. I no longer use real in my home. They are too messy and don’t last long. I got them at a local shop. Wow – I love your local shops! Yvonne, your kitchen is just so beautiful, warm, and inviting for all seasons…I always look forward to what you will be doing for Christmas…the title of this post should be the “Perfect Christmas Kitchen” …… Love all the gorgeous details. Hi, I love your blog and stealing ideas. Where did you find your pig? My girls show pigs and I would love to find one of these for my kitchen. Thanks! I got Earl from an online shop that is now closed. Sorry! Did you try to google stone pig head? Your kitchen is so pretty. I like how you decorated your glass canisters. *LOVE* them! Fabulous! 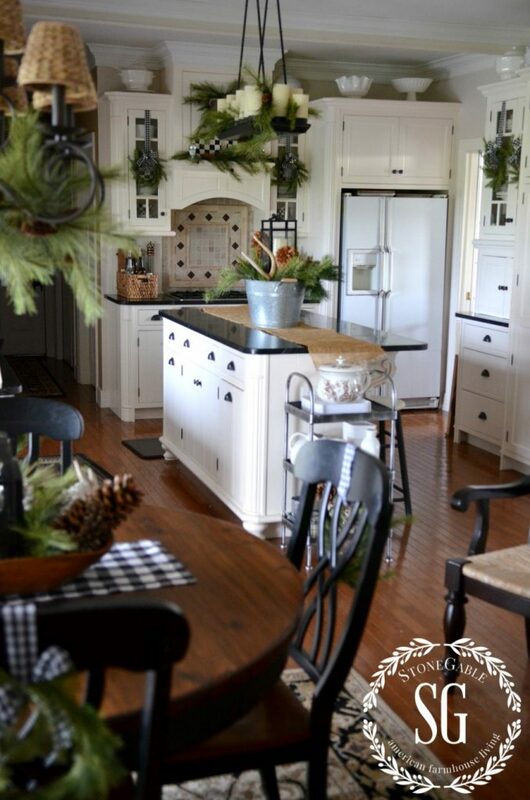 Yvonne, I love this kitchen decor… and the pine is so beautiful. And yes, Earl is very handsome this year!! Thanks for sharing in the Home for the Holidays Tour. Hugs! In my post earlier I forgot to ask if the table lantern was from a local shop or on line? Any idea of where I could purchase this lantern? Thank you…. Where do you get your greenery? It looks so real! Love your kitchen. I am wanting to know this as well. My house is a mess right now, because I’m still decorating! I have to finish up some things after work today but just got truly inspired to get in my kitchen and finish up. I love this clean, simple farmhouse look! I’m trying to weed out any decorations I no longer love. I look at it, and ask myself “do I love this?” If the answer is “meh” then it’s going in the donation box! I love the greens, and the use of black gingham ribbons. In fact, I ordered some for my kitchen already, and am using some of the white dishes and pitchers I use in my kitchen all year long! 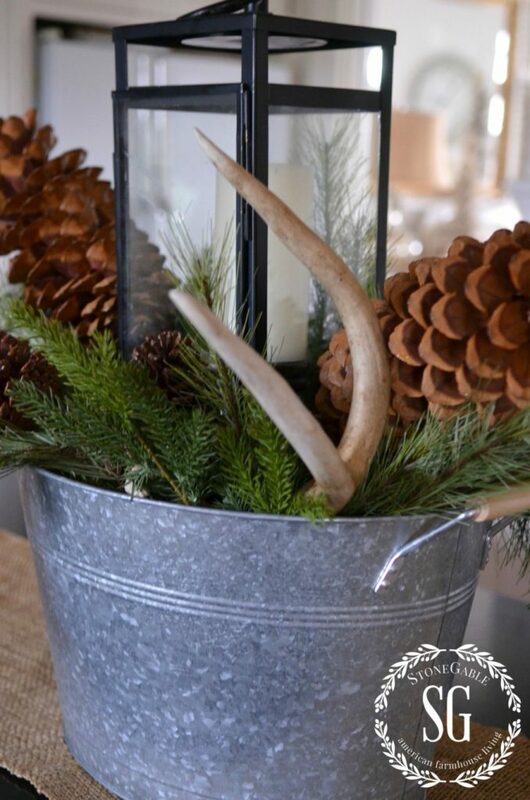 Just add some greenery, pine cones, and ribbons and you’re good to go! Thanks for this beautiful inspiration. You inspire me every day! Blessings to you! I love the canister, with tiny ornaments, sitting amongst the baking ingredients . . . As they too are an important ingredient, for the holidays! So pretty! You have a beautiful home! The black and white ribbon was an inspired idea. So beautiful that I may just have to COPY!!! I love your kitchen dressed for the holidays! Your lush greenery mixed with black, white and pops of green is beautiful … perfectly inviting in your gorgeous farmhouse kitchen! Happy Holidays! Yvonne, Your heart of the home is as beautiful as always…my favorite inspiration blog. I have a quick question. For the last few years, I have been on the hunt for realistic garland. I love your pine. I am assuming it is artificial since you have to leave it up for so long. Would you share your source? Thank you!